Kristin is a Lutheran Pastor, married to Lee Liming, and mom of Evan, Noah, and Micah. She grew up in Albuquerque, and is thrilled to be living here again after going to school and beginning her ministry in the Midwest. Albuquerque is a great place to raise kids, and St. Michael and All Angels is a great church for families! Kristin was born in 1969, and her first home was Dzilth-na-o-dith-hle (in the Navajo nation), where her parents taught school. She moved about six times in her first eight years; in third grade she moved in to the house in the North Valley of Albuquerque where her parents still live. She attended Alvarado Elementary, Taft Middle School, and Albuquerque Academy. She grew up attending St Paul Lutheran Church, the "ski-slope church" at the Big I.
Kristin went north to explore her family's Midwestern and Lutheran roots at St. Olaf College in Northfield, MN. She majored in math and religion, with a concentration in Stories as Expressions of Faith. Her first job out of college was as Youth and Family Minister at Family of Christ Lutheran Church in Chanhassen, MN (a suburb of Minneapolis.) Within a few years, she started taking classes at Luther Seminary in St Paul. 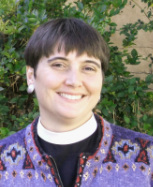 Disheartened by a perceived disconnect between seminary and social justice, Kristin left school and returned to Albuquerque to work in a domestic violence shelter. But her "Jonah time" didn't last too long, and within a year she was starting Clinical Pastoral Education at a hospital in Milwaukee. After CPE, Kristin worked for a year at St. Camillus HIV/AIDS ministry while attending classes in Chicago; then spent her internship year in inner city Detroit. She finished her schooling at Lutheran School of Theology at Chicago, and graduated with her Master of Divinity in 1999. During her internship year, Kristin met Lee Liming, and they were married in April of 1999. In December of 1999 she was ordained and began to serve at All Saints Lutheran Church in Palatine, IL. Kristin has three children: Evan is in sixth grade, Noah is in second grade, and Micah is in kindergarten at North Valley Academy. Before beginning work at St Michael’s in 2011, she was an at-home Mom for a while – doing a bit of interim and supply preaching on a part-time basis. Travel is one of Kristin's great loves, and during her college and graduate school years she was privileged to travel and study in Rome, Israel, Zimbabwe and Kenya. With three kids, her travels now don't range so far, but she has been lucky to take her family camping and vacationing in the southwest and to make fun trips to Madeira Beach, FL, and Niagara Falls. Kristin enjoys reading and has collected beautiful picture book since long before she had children. She also loves biking, walking, camping, watching TV shows from the Syfy channel, and playing basketball and soccer with her boys. Click the button to the left for an archive of Kristin's Sunday morning sermons!